At the time, neither D. Appleton & Company, publishers, nor James Slater could know that their paths would intersect at the corner of 13th Street and Fifth Avenue a quarter of a century later. Daniel Appleton had founded the publishing house in 1825 far to the south on Exchange Place near the Bowery. Originally a book importer and seller, the business grew at an astounding rate. Before long Appleton moved to Clinton Hall at Beekman Street. It was the first of a rapid succession of relocations. In January 1838 Appleton’s son, William, was taken into the business and it moved again, to No. 200 Broadway. Upon Daniel Appleton’s retirement in 1848 William formed a partnership with his brother, John Adams Appleton, and the business moved once more—to Broadway and Leonard Street. Then to Nos. 443 and 445 Broadway. Then to No. 94 Grand Street at the corner of Greene. After that, around 1880, the firm moved to Nos. 1 through 5 Bond Street. By now Appleton & Company was among the leading publishers in the nation, producing school books, religious tracks, encyclopedias, and a wealth of other texts; along with stereopticon cards, pamphlets and cabinet photographs. In 1893 the publisher was ready to move yet again. The old Lenox House hotel was demolished and in its place two sets of brothers, Marx and Moses Ottinger, and Isidore I. and Max S. Korn, built Appleton’s new headquarters and store. Completed in 1894 the new 51-foot wide structure stood in stark contrast to the dour brownstones along the avenue. Constructed of light-colored stone, buff brick and terra cotta, it was a brilliant presence. The Romanesque Revival design unapologetically blended medieval and Celtic motifs with a classical Greek key frieze between the third and fourth floors. Below the pressed metal cornice a row of aloof female faces stared with disinterest and a pointed story-tall corner finial completed the design. A close look reveals cornice brackets in the form of female faces. In 1896 fabulously wealthy Louis L. Lorillard purchased the building. One of four sons of Pierre Lorillard, he was regarded as one of the wealthiest young men in New York upon his father’s death. He spent $445,000 for the property – about $10.5 million today. The New York Times noted that the sale was “subject to leases for eight and three years.” That would include, of course, the lease of Appleton & Company. Despite the embarrassment, the Appleton firm continued publishing and selling on a grand scale. 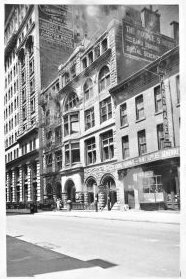 So grand, in fact, that in September 1902 the company moved once again, this time to a fine new building at the corner of Fifth Avenue and 39th Street. In April of 1910 Henry Corn signed a 21-year lease on the building, still owned by the Lorillard family. Corn was in the process of building an L-shaped store and loft building that would wrap around the corner lot. “He has secured the corner property primarily to protect the light and air of the adjoining building,” explained The Times. In March 1915 the former Appleton Building got a new name when cigarette manufacturer Philip Morris & Co. leased the building “for a long term of years.” For years No. 72 Fifth Avenue would be known as the Philip Morris building. 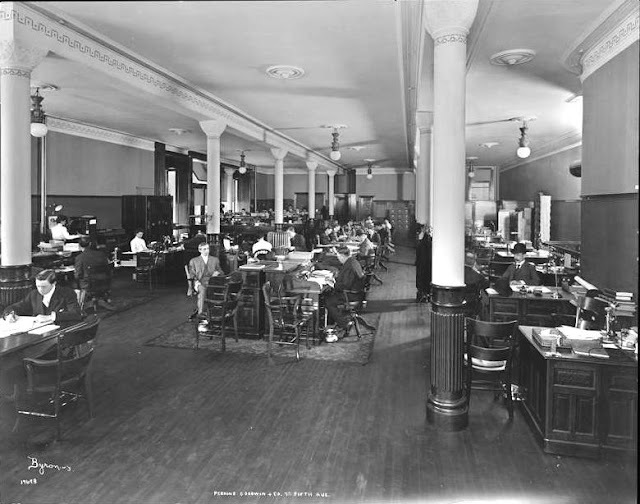 Another long-term change came about on August 12, 1929 when The National City bank leased the ground floor, once the retail store of Appleton publishers. The space was renovated as a branch banking and safe deposit office that would be a familiar presence in the neighborhood for decades. The building that had been erected as a publishing house became one again when Ginn & Co., educational publishers purchased it in October 1946. The nationally-recognized firm had been across the street at No. 70 Fifth Avenue for sixty years. It announced that the National City Bank would continue to occupy the first floor while it would use the upper six floors for its own use. 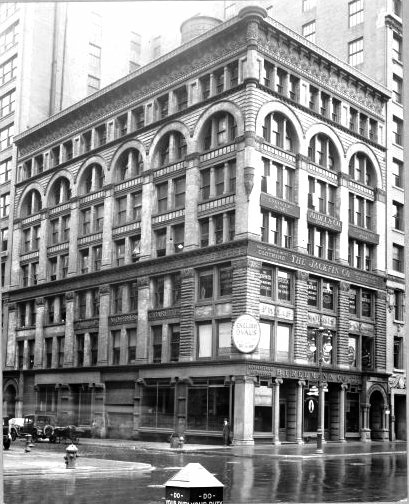 By 1959 when an investor purchased the building, Ginn & Co. had reduced its space in the building and leased out a portion of the third floor to the New York Brass and Copper Company. Two years later New York Brass and Copper expanded to a full floor. In the 1980s the Human Sciences Press, publishers of The Journal of Aging and Judaism among other periodicals, joined the publishing community within the building. By now the façade of the first floor banking level had been seriously modernized. The medieval columns and arches had been covered over by stone panels to disguise the Victorian design. But by the end of the century a restoration found, incredibly, that everything was entombed and waiting to be exposed. The polished granite columns with their stylized Ionic capitals were intact behind the modern facade. Today the building is home to the New School University’s Milano Graduate School of Management and Urban Policy. Although the fantastic pointed finial on the roof long ago disappeared, the building looks much as it did when Appleton & Co. first opened its doors in June 1894. A contemporary lithograph shows the block-encompassing building in the inset and the soaring cast iron arches. Yet from its inception Babcock intended the building to house more than just ice skating. Even before the rink was officially opened the New-York Athletic Club (of which Babcock was a co-founder in September that year) hosted its first semi-annual games here on November 10. The building was crowded with spectators who were no doubt as eager to see the new structure as to see the games. The athletes and spectators alike may have been a bit disappointed. Half of the roof was not yet in place and the day of the games was stormy and frigid. The games committee rushed to commandeer all the used tarpaulins they could find in the area and jerry-rigged a roof as best as possible. Among the expected meets, from a modern viewpoint, like the running broad jump and running high jump, were some more particularly 19th century events. “There was now an exhibition of French velocipedes, two of which were driven rapidly around amid the plaudits of the audience,” reported The Times. And J. E. Russell, who took first place in the One-Mile Walk was admired by the press. “Mr. Russell’s walking was a splendid exhibition, and drew forth loud applause,” said The Times. Schribner’s Magazine was less enthusiastic. “The records made were very ordinary,” it reported. On December 14 that year the Parks Commissioners allowed skaters the use of the city ponds. The Empire City Skating Rink beat them to the punch by opening a day earlier—even though the grand opening was still a few days off. 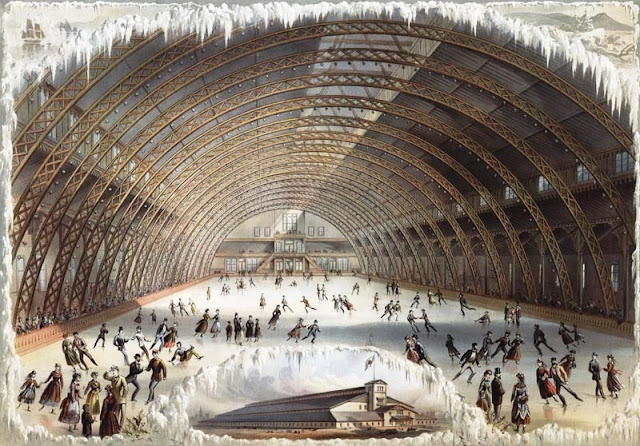 Throughout the afternoon and evening around 3,000 skaters visited the rink although “only one-half the entire ice-bed was permitted to be used.” Dodworth’s Band played as the happy skaters glided round and round into the night. “In the evening the building was beautifully illuminated, though all the gas jets were not lighted,” said The Times. Things went a bit more smoothly the following year as the rink was prepared for skating. The ice was slowly built up layer by layer to ensure perfect conditions. Skaters eagerly watched for the appearance of flags that announced that the ice was ready. 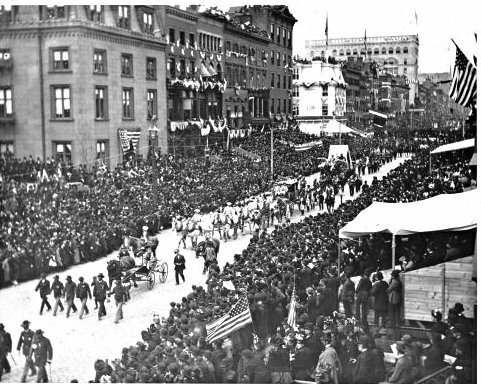 The flags were attached to the Second and Third Avenue street cars as well as the Empire Rink itself. In the meantime the American Institute was having problems. 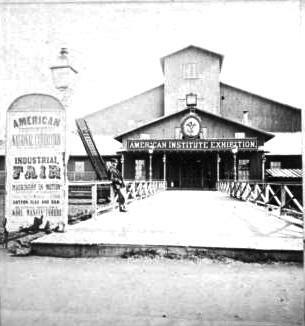 The organization had been formed in 1828 to “promote and encourage the industrial arts in America.” A principal means to accomplish these goals was the staging of annual exhibitions in which inventors, manufacturers and others displayed their innovations. The exhibitions were greatly successful, introducing the public to inventions like Samuel Morse’s magneto-electric telegraph. Morse’s invention was exhibited at Niblo’s Garden, where the fairs were annually held. But it was destroyed by fire in 1846. Then, until 1853 the group exhibited at Castle Garden, and subsequently took over the immense Crystal Palace behind the Croton Reservoir. It was an impressive setting; but on October 5, 1858 an inferno consumed the Palace and all the inventions on display inside. The Institution moved around for the next decade, but now eyed the Empire Skating Rink which “contained at that time the largest exhibition hall in the United States,” according to The Times. Beginning in 1869 it leased the great space in what would become its home for years. Tickets could be purchased for 50 cents (children under 12 years old for 25 cents) or season tickets were available at $3 for gentlemen and $2 for ladies. The Second and Third Avenue railroads added nearly one hundred extra cars to accommodate the throngs. Ticket holders would tour the Department of Fine Arts and Education (paintings, glass, engravings, photographs, sculpture, musical instruments, etc. ), the Department of the Dwelling (apparatus for lighting, warming, cooling, and ventilating, cooking stoves, kitchen utensils carpets, furniture “ornaments for parlors,” etc. ), the Department of Dress and Handicraft (wearing apparel, sewing machines, artificial limbs, wigs and hair-work, jewelry trunks, umbrellas, etc.). In the Department of Chemistry and Mineralogy were soaps, paints, dyestuffs, sugars and “gutta-percha preparations” among others; there was the Department of Engines and Machinery; the Department of Intercommunication (including locomotive engines, cars, carriages, wagons, sleighs, models of ocean or river vessels, electric telegraphs, etc. ); and the Department of Agriculture and Horticulture where visitors viewed plants and flowers, cheese, butter, plows, cheese presses, and other products for or from the farm. While the America Institute grabbed the spotlight during the warmer months, the Empire Skating Club held sway in the winter. On February 24, 1870 it was “the scene of great animation and gaiety” when the club hosted a fancy dress and masquerade carnival on skates. The indecorous language did not sway the majority and the rink was purchased by the Institute. The building continued to be home not only of the annual fairs, but of athletic events and other spectacles. In the spring of 1877 a five-mile walking race took place here. In 1881 when the Westminster Kennel Club and Madison Square Garden could arrive at a mutually acceptable rent, the club turned to what was still widely known as the Empire Skating Rink. The building was well-suited for the esteemed dog show with its greater floor space. The single objection before opening day was the location which was feared to be too remote. But instead, newspapers reported that on opening day the show was so crowded—even with twice the space as Madison Square Garden—that moving about was difficult. Twenty-five years after its construction, the ground-breaking skating rink was demolished to be replaced by the handsome Flemish Revival exhibition hall. But, as is often the case in Manhattan, good architecture gives way to bland and this wonderful building, too, did not survive. An unappealing brown brick apartment building was erected on the site in 1961. An Improbable Survivor -- No. 11 East 11th St.
As the Fifth Avenue blocks just north of Washington Square developed, wealthy attorney and property owner George Wood joined the trend. Henry Brevoort, Jr. had built his grand, free-standing Greek Revival mansion at the corner of 9th Street in 1834. The avenue at the time was desolate, but the presence of the powerful and wealthy Breevorts would soon change that. Within a decade the lower blocks of Fifth Avenue filled with the homes and churches of New York’s richest citizens. George Wood built his mansion, No. 45, at the corner of East 11th Street. The attorney held vast amounts of real estate—including no fewer than 39 houses in Brooklyn, most along Sidney Place, State Street and Joralemon Street; vacant building lots and docks in Brooklyn; 340 acres in Minnesota; a 30-acre farm in Rye, New York; and land in Walde, Texas. To accommodate his carriages and horses, Wood acquired the building lots stretching through the block from 11th to 12th Streets behind his mansion. His “carriage house and stable” was set far back from East 11th Street, possibly to relieve his fashionable neighbors of the unpleasant odors. The Wood family included five daughters—Catharine, Anna, Mary, Julia, Louisa—and two sons Frederick and George. As the threat of civil war rumbled, George Wood would make his opinions on slavery vividly apparent. W. M. Evarts diplomatically called him “a man who loved the Union and the whole Union.” However his comments that the slaves were of an “inferior” race would bristle the ire of many. In 1858, at the age of 69, Wood was afflicted with paralysis. Two years later, at round 1:00 in the morning on Saturday March 17, 1860, he woke with a pain in his arm. Mrs. Wood attempted to help by rubbing his arm; but he broke out in a cold sweat on his forehead and soon after died. A century and a half later, the symptoms point to a heart attack. When Wood’s widow left No. 45 Fifth Avenue is unclear; however the carriage house somehow became part of an shockingly unexpected scandal within seven years of Wood’s passing. At 11:00 on the night of July 20, 1867 “Sergeant Haggerty, Roundsman Rae, and Officers Barker and Inman, of the Fifteenth Precinct, made a descent upon the disorderly house No. 11 East Eleventh-street,” according to The New York Times the following morning. Somehow George Wood’s carriage house had been transformed into a brothel, squarely in the center of Manhattan’s most exclusive residential neighborhood. Five women, aged 18 to 28, and two men, Marshall Allan, 21 and Robert Baer, 18, were arrested. “The prisoners were all marched off to the Mercer-street Station-house and locked up for examination,” said the article. Respectability came back to the little building when H. Van Rensselaer Kennedy moved into No. 45 Fifth Avenue. His purchase of the house increased the Kennedy presence in the neighborhood, which was already substantial. Robert L. Kennedy lived at No. 99, Rachel L. Kennedy at No. 41 and Mary L. Kennedy lived around the corner at No. 10 East 11th Street. Change comes quickly to New York City neighborhoods and by World War I most of the lower Fifth Avenue mansions, including No. 45, were mere memories. Around the corner on East 11th Street was the Hotel Van Rensselaer and on the corner of Fifth Avenue No. 43 was now an 11-story apartment building. But sitting smugly between the two towering buildings George Wood’s carriage house with its deep grassy approach still clung on. With the disappearance of horses as motorcars took over, the little two-story building had been converted to a garage. David H. Nott who owned the hotel was rightfully concerned about the future of the little garage. Were it to be leveled and a tall building erected, his hotel would lose air and light. And so he bought it. In July 1921 he hired architect C. F. Winkelman to convert the garage into a one-family dwelling, “forming an annex to the Hotel Van Rensselaer,” reported the New-York Tribune on July 28. The architect estimated the renovations would cost about $10,000. Because Knott Realty Company owned both the “apartment hotel” at No. 43 Fifth Avenue and the Hotel Van Rensselaer, it had a vested interest In keeping the little house intact. The New York Times made special note of the charming condition of the house on April 16, 1930. That same month William Simmons, “a steamship man,” leased the house; but it appears the deal fell through. A month later stock broker Arthur L. Selig and his family were living here. Selig was a member of the firm Perez F. Huff & Co., Inc. at No. 75 Maiden Lane. But the Great Depression, with its haunting images of stock brokers flinging themselves from office windows, visited the little house on East 11th Street. Family friends reported that Selig “worried over losses in the stock market” and only weeks after moving in, Selig committed suicide by shooting himself with a pistol. In 1951 the Hotel Van Rensselaer, the apartment building at No. 43 Fifth Avenue, and the house at No. 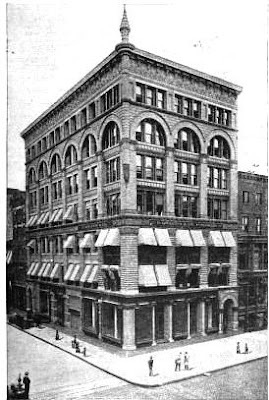 11 East 11th Street were sold to Samuel D. Bierman as a package. As the trio of buildings continued to survive with little change, a small Jewish congregation was formed in 1959, Congregation Etz Chaim, the “Tree of Life.” As it gained its bearings, the fledgling congregation held services in the Fifth Avenue Hotel. The 1925 Church of St. John Nepomucene -- No. 411 East 66th St. The Slavok movement into the United States started slowly. In the 18th century only a relative handful of immigrants from Slovakia, then a portion of the Kingdom of Hungary, were documented. But following the American Civil War, the Hungarian Nationalities Law of 1868 initiated magyarization—the forced adoption of the Hungarian culture and language by non-Hungarian nationals. Suddenly mass immigration of Slovaks into America began. Unlike some other ethnic groups that swelled along the East Coast in the 19th century; the Slovakian population tended to move on from the port cities to the open farmlands. More than half of the 500,000 immigrants between 1880 and 1925 settled in Pennsylvania, while others went further into the Midwestern states of Ohio and Illinois. The early Slavokians who stayed in New York remained on the Lower East Side—an area filled with Hungarians, Germans, Polish and other Central European immigrants. By 1891 the Slovakian population here was large enough that the Society of St. Matthew was formed; a Catholic group that dearly wanted its own parish. 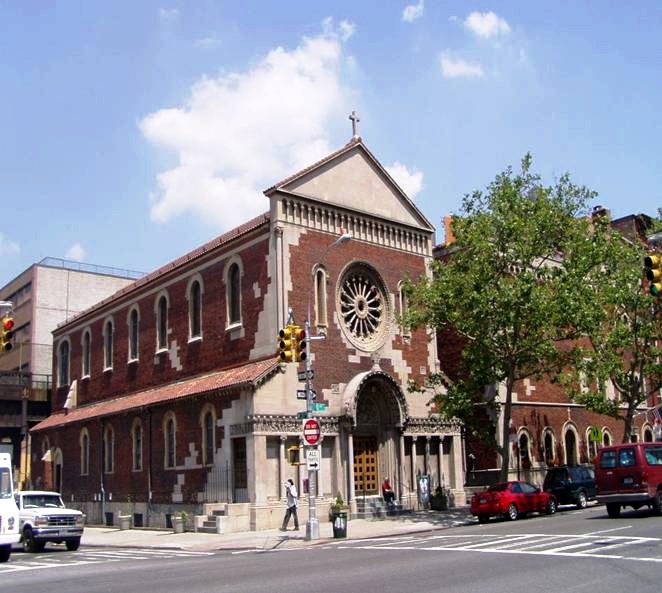 The powerful Archbishop Michael Corrigan approved the formation of the St. John Nepomucene Parish and on October 25, 1895 the first mass was held on East 4th Street in the Lower East Side neighborhood. The congregation took its name from the Bohemian Saint John of Nepomuk. The 14th century priest was the confessor of King Wenceslaus and his queen. Legend and history collude to tell his fascinating tale. In 1393 the king, concerned that his wife may have a lover, demanded that John reveal the queen’s confession. The priest refused, resulting in his torture. When he still withheld the queen’s confession, on March 20 the frustrated King Wenceslaus had him tossed into the Vltava River from the Charles Bridge in Prague where he drowned. Five hundred years later the parish named for the saint had trouble keeping its congregation together. Life for the mostly-impoverished immigrants who did not speak English was difficult. Equally hard was finding a local Catholic priest who spoke Slovak. 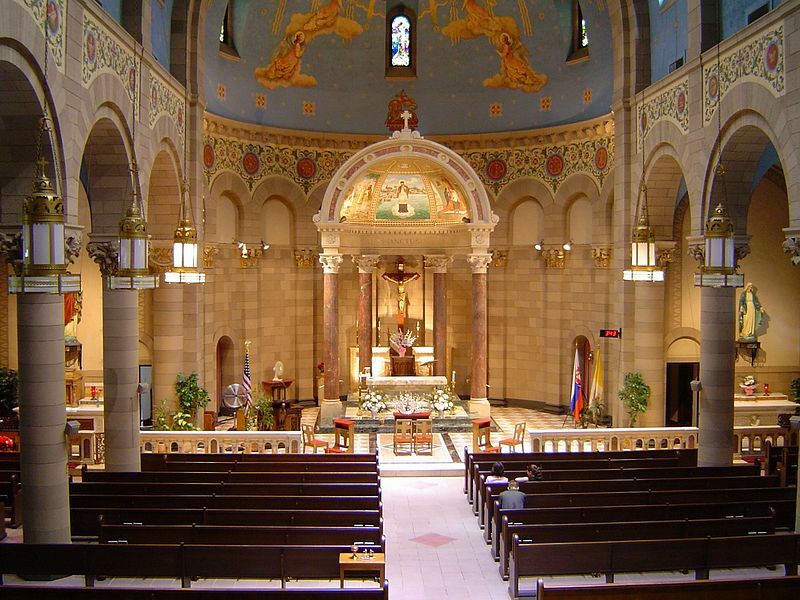 Fifteen priests would come and go within the first thirteen years of the parish’s existence. The parish survived, however, and grew. As the Yorkville neighborhood became the preferred home of Hungarians, Slovaks and Poles in the first decade of the new century, St. John Nepomucene relocated to No. 350 East 57th Street in a former synagogue. By the early 1920s the congregation had grown large enough to support a school. Another move was deemed necessary. Land was purchased on East 66th Street near First Avenue and architect John Vredenburgh Van Pelt was commissioned to design a grouping of church, school and rectory buildings. Born in Philadelphia, Van Pelt was as well known as an architectural historian and author as he was for his designs. If the idea to build a church that reflected the Slovakian heritage of his clients ever occurred to him, he discarded it. Instead he turned to the Southern Sicilian Romanesque style, drawing inspiration from the Clunic and Benedictine Moissac Abbey in Tarn-et-Garonne, France. Completed in 1925, the red brick and limestone church was embellished with fine base reliefs, thin stone pillars upholding a handsome corbel table, an intricate rose window, and dramatic hooded entrance. On the inside, Van Pelt provided a more substantial nod to the roots of the parish. The triptych mosaic over the altar depicted scenes from the lives of brother saints Cyril and Methodius, who brought Christianity to the Slavs, and that of St. John. The group of structures cost the parish $300,000, over ten times that amount by today’s standards. 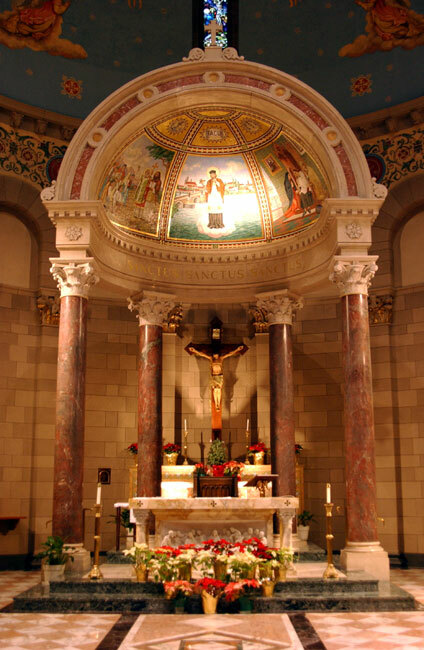 Van Pelt was apparently pleased with the result, for just four years later he designed the new Church of the Guardian Angel on 6th Avenue—a scaled-down near copy of St. John Nepomucene. Guardian Angel, in the Chelsea neighborhood, was a scaled-down version. The church was the scene of Slovak weddings and funerals and the center of social life for many of the immigrant families. As mid-century approached Reverand John Lissie was priest here. The down-to-earth Father accepted an invitation to go fishing on East Chester Bay in the Bronx with neighbor and parishioner John Mihalek on November 5, 1948. It turned out to be a bad idea. The men rented a rowboat from Miek’s Boat House and rowed far out onto the bay where they enjoyed a relaxing afternoon fishing. As the sun began to set, however, a dense fog rolled in, enveloping the boat and the amateur fishermen. “The victims of the sea fog,” said The New York Times, ”were helplessly lost and began shouting for help. Around 7:30 p.m. Maxwell S. Greenwald heart the calls coming out of the thick fog. He and his brother called for police, then, assuming the men were in the water, stood on the bank and yelled back into the fog. They repeatedly told the pair to keep their heads above the water. Thirty minutes later, at last, a launch found the floundering priest and his parishioner and towed them back to Fort Schuyler. On September 10, 1976 The New York Times reminisced about the quickly-disappearing Slovak neighborhood around the church. “You’d better look quick, because it will all be dead in five years. Ten at the most,” residence Josef Sereda told a reporter. Not all of the Slovakian culture was gone yet, however. One of St. John Nepomucene’s parishioners was Ferdinand Peroutka; a man with an amazing past. In 1924, the year that the first bricks were laid for the new church, Peroutka was living in Czechoslovakia. A young, idealistic journalist he founded the political weekly newspaper Pritomost. Peroutka’s paper would become the leading liberal voice of Czechoslovakians in the years between the two world wars. He later was editor in chief of the weekly Dnesek and of the daily newspaper Svobodne Noviny. The outspoken journalist made an enemy in the Nazi Party and when Czechoslovakia fell to the Germans he was imprisoned at Dachau and Buchenwald concentration camps for six years. With the end of the war he was released in 1945 and returned to Prague where he picked up his battle against oppression. As the editor in chief of Lidove Noviny, he fought the infiltration of the Czech government by Communists. When the Communists took over Czechoslovakia in 1948, he was fired. After the inspiring Peroutka’s death on April 20, 1978, a memorial service was held at St. John Nepomucene Church. As always, though, memorials at St. John were conducted for rich and poor, great and small. Richard Demattia became a neighborhood fixture in the 1980s, known to doormen and school children. Although not indigent, Demattia was homeless; apparently by choice. He chose, too, to sleep on the steps of St. John Nepomucene. Demattis purchased The Christian Science Monitor and The Wall Street Journal every day and went about his normal routine, never asking for a handout. Early on the morning of February 16, 1989 Demattia spoke with a construction worker then went back to the church steps. “He must not have felt well,” Father Tomlian told The New York Times, “because after that, he lay down on his bedroll outside the church.” And he died. The 8:00 morning mass the following day was offered in memory of the homeless man who slept on the church steps. While the neighborhood continues to change, St. John Nepomucene still conducts one mass every day in Slovak and hears confessions in Slovak, English, Czech and Polish. The remarkable Romanesque-style building, erected for Slovak immigrants nearly a century ago, stands as a reminder of when Yorkville was a close-knit Central European community. The conditions for these naïve young women were a concern to some Manhattan socialites as well. The girls made little money for which to pay for lodging, they were prey for evil and unscrupulous men, and their respectability was in jeopardy. The organization was incorporated in 1873 and the women set about finding a suitable home. At No. 7 East 15th Street just off fashionable Fifth Avenue sat the Brown House, an imposing 75-foot wide mansion erected in 1853. The house was purchased for $75,000 (an impressive $885,000 today). An additional $25,000 was spent to renovate it for the new group’s purposes. On March 31, 1876 The New York Times described the facility. 685 women took instruction that year and the average daily attendance in the free library (which held 17,769 volumes) was 132. The employment office had placed 1,225 women. But success brought problems. The association decided to demolish the old building and erect “an extensive building, which shall fulfill the demands for room as far as possible.” The proposed building was to be five stories high and to cover the entire plot. The estimated cost of the project, including furnishings, was $125,000. The Young Women’s Christian Association had been the pet charity of Margaret Louisa Shepard, the daughter of William H. Vanderbilt, for some time. She and John Jacob Astor, along with other wealthy citizens and neighborhood businessmen, donated the necessary funds. Prominent architect Robert Henderson Robertson was commissioned to design the structure. The substantial base of rough-cut brownstone blocks was rhythmically relieved by a series of graceful arches, echoed at the fourth stories. A year later Margaret Shepard personally donated an extension to the rear—the Margaret Louisa Home—that fronted onto East 16th Street and was connected by a corridor. The Home provided lodging for young women seeking employment in the big city. The money would go to pay “the salaries of the Librarian and three Assistants, and for the necessary binding of books and periodicals,” and the purchase of books. There were entertainments for the women here, as well. Well known singer Clara Clemens, the daughter of writer Samuel L. Clemens who lived nearby, gave a concert here. And girls in the sewing and arts classes looked forward to the annual Christmas sale when their goods were offered to the public. In describing the sale in 1904 the New-York Tribune shed light on the classes available. Girls entering the building were expected to dress with decorum. In 1908 with the wide-brimmed Merry Widow hat all the rage, Bessie A. Losey outlawed the fashion accessory on the premises. Miss Losey taught girls “the gentle art of fashioning hats to millinery-mad members of the Young Women’s Christian Association,” said The Evening World on May 22. But the trendy hats were not the only prohibited apparel. Ms. Losey accepted hats with a circumference up to forty inches. The Merry Widow hats measured from sixty to seventy inches. “Its exaggeration makes the ‘Merry Widow’ conspicuous, and it is bad taste to be conspicuous,” she told the reporter. Worries about the circumference of hats would become insignificant in the building at No. 7 East 15th Street in 1917 when it was sold by the Association to the Society of the Commonwealth , Inc. Now known as The People’s House, it became home to socialist groups and labor organizations—many of which were viewed as radical. Among the first groups to move in were the National Woman’s Suffrage Party and the Birth Control League of New York, headed by Margaret Sanger. 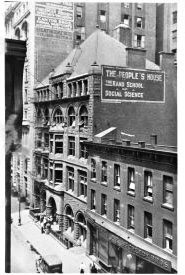 The Rand School, formed by the members of the Socialist Party of America in 1906 took space here. It not only offered politically-biased classes to the working class, but provided a research bureau, publishing office, library and ran a summer camp for socialists and labor union activitists. Among the faculty was Dr. J. McKeen Cattell who was fired by Columbia University “for what may be charitably described as ultra-pacifism,” according to the New-York Tribune. The ongoing war between the government and the socialists was now centered at East 15th Street. The socialists did not take it lying down. “The Committee of Eight” of the Socialist Party was organized and held an all-day meeting in the building on January 11, 1920 to devise legal retaliation. The committee prepared to attack the committee members personally. In 1956 the the Society of the Commonwealth , Inc. moved out, turning the building over to the International Association of Machinists. The building was used for the next few decades as office space and a meeting hall. Then in 1988 the time-worn building was purchased by Soka Gakkai International, a California-based Buddhist congregation that goes by the initials SGI-USA. The group initiated an exterior restoration, completed in 1994, that brought Robertson’s lusty building back to life. By now the interiors were almost totally obliterated, requiring new but historically sensitive renovations. The 1904 Auchincloss House -- No. 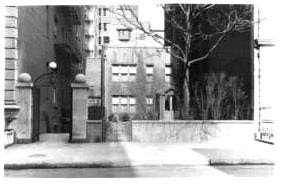 33 E. 67th St.
Miss Keller's School-- Nos. 35-37 East 62nd St.